Bob Ledesma bought his 1992 MX-5 Miata from a friend for only $500, with the promise of bringing it back to showroom condition. Since then, he has spent countless hours carefully restoring the car, sparing no detail. Ledesma called the the project a “labor of love.” It wasn’t just the promise to his friend that pushed him to continue working on the car, but also the love for the car. Like his fellow MX-5 drivers, Ledesma doesn’t have just one thing he loves about his MX-5. Residing in Southern California, Ledesma’s favorite drive is the Pacific Coast Highway. Ledesma has had the opportunity to take his MX-5 around the country. Aside from his local PCH drive, he’s most fond of a drive he took with the Utah Miata Club through Bryce Canyon in Utah. 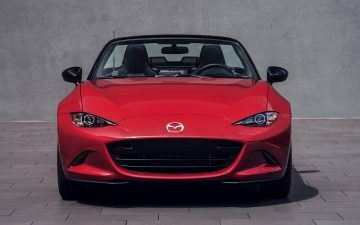 In 2014, Ledesma, along with more than 2,500 other Miata owners, drove to Mazda Raceway Laguna Seca to help set the Guinness World Record for the most MX-5 Miatas in one place. Ledesma’s love for Miata brought him to join not just one, but two Miata clubs: the Southern California Miata Club and the 805 Miata Club. Through both of these clubs he’s had the opportunity to travel to breathtaking locations such as Yosemite and has the pleasure to meet and drive with owners of all ages. He was even able to attend the reveal of the 2016 MX-5 Miata and WeatherTech Raceway Laguna Seca (formerly Mazda Raceway Laguna Seca). Ledesma turns 70 years old next month, but feels as youthful as ever.